Liam Maguire, "Next Goal Wins! 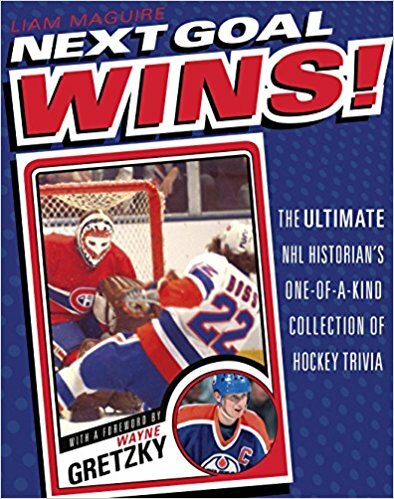 : The Ultimate NHL Historian's One-of-a-Kind Collection of Hockey Trivia"
Fun, always surprising and a hockey lover's treasure chest of the little-known facts that shaped the game, you cannot Google the stuff that Liam Maguire shares in this entertaining little book. About 30% updated, revised and renewed from Macquire's 2001 trivia collection, What's the Score? Seriously, you cannot Google most of this stuff. Liam has scoured the depths of the NHL archives to put together many of these questions and answers, which you can't get from just looking up your favourite player on Wikipedia. What sets his take on hockey trivia apart from the many pretenders out there is the magical connections he builds between the numbers, the players and the game's history. Besides the straight goods, you always get the ultimate "And did you know?"